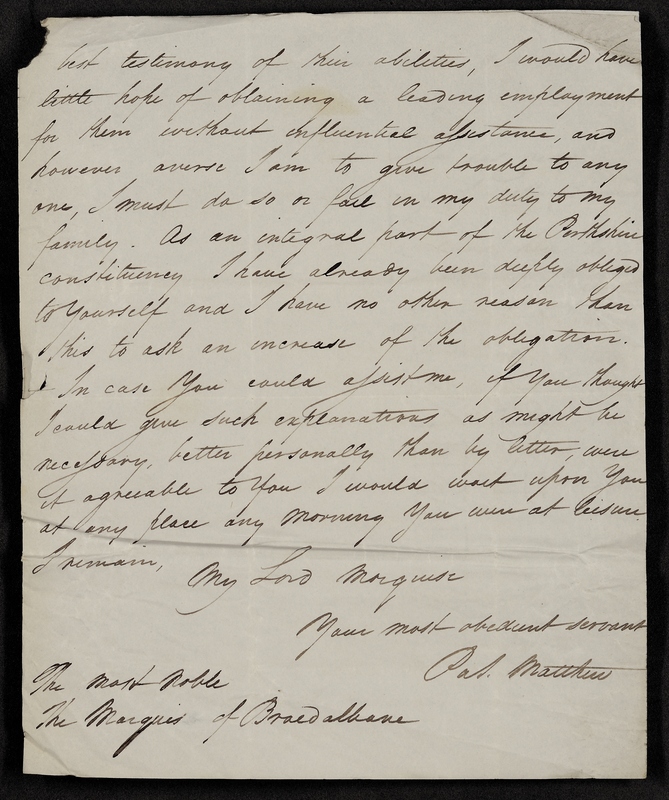 Matthew asks Breadalbane to consider employing two of his sons to help manage a proposed trigonometric land survey of Scotland. The letter is held at the National Records of Scotland, under reference GD112/74/42/11. It seems Government has resolved to have a trigonometrical survey of Scotland carried through. Two of my sons (civilians) have been engaged in the Irish survey – There are three divisions of observers carrying on this survey. My eldest son has the command of one of these divisions : His division consists of 7 or 8 parties (some of them military, some civilians). He first surveys the country, county by county, in triangles of about 6 miles side with a theodolite as large as his men can conveniently carry about, leaving directing centres drilled on earth fast stones, and is followed by the parties under him with smaller instruments cutting up the 6 mile triangles into triangles of 1 or 2 miles side. – This instrumental measurement is then tested by chain measurement & the survey completed by the chaining parties under engineer officers. In speaking with Mr Maule last winter about a survey of Scotland, he stated that he thought, should Government enter into any more surveys, that it would employ civilians alone. Should this be the case I do not know how they could be so well served as by those who are carrying on the Irish survey, and chosen by Col. Colby and the heads of the Irish survey on account of practical efficiency, free of interest of any kind, to take a management. I have no doubt that my sons, had they sufficient time allowed, would execute, at least the instrumental part of, the survey of Scotland in the most correct manner and at much less cost than though military were employed. In Ireland it takes my eldest son from 2 to 4 months to survey a county of ordinary size. 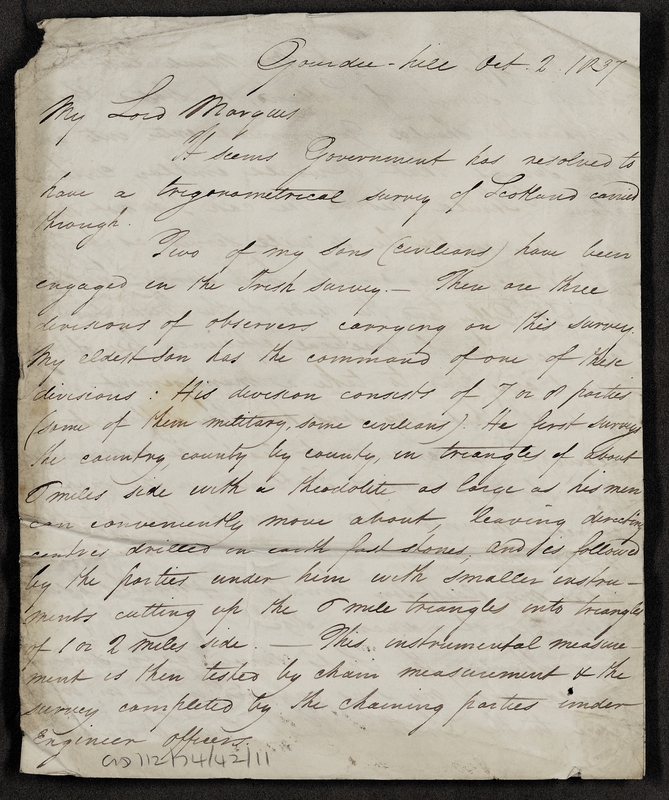 Should the Scot’s survey go on soon, I would wish my sons engaged in it, in preference to the Irish.– although I were producing the best testimony of their abilities, I would have little hope of obtaining a leading employment for them without influential assistance, and however averse I am to give trouble to any one, I must do so or fail in my duty to my family. As an integral part of the Perthshire constituency I have already been deeply obliged to yourself and I have no other reason than this to ask an increase of the obligation. 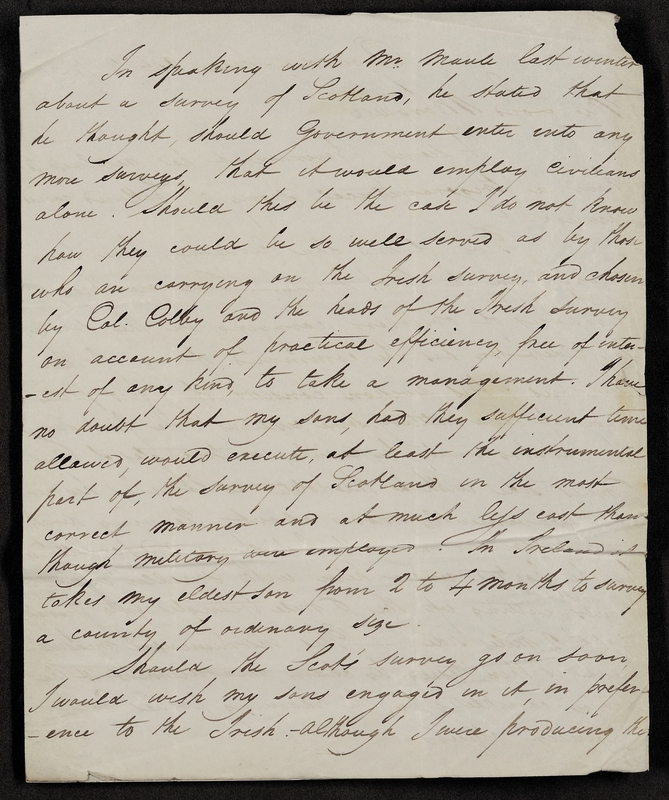 In case you could assist me, if you thought I could give such explanations as might be necessary, better personally than by letter, were it agreeable to you I would wait upon you at any place any morning you were at leisure.